A distance or open learning course requires much more than simply mastering your subject. It also asks that you develop a variety of study and management skills, such as time management, varying learning techniques and the ability to structure and present your thoughts in a logical and authoritative way. This might seem like a lot to expect of you as you face the prospect of a new course, but these skills, once acquired, will be of benefit to you throughout your course and beyond. It is often the management skills you learn on a course that stay with you longer than any formal part of the learning process. The good news is that once you have begun to master these challenges, you will find your course easier, more manageable and ultimately more satisfying. 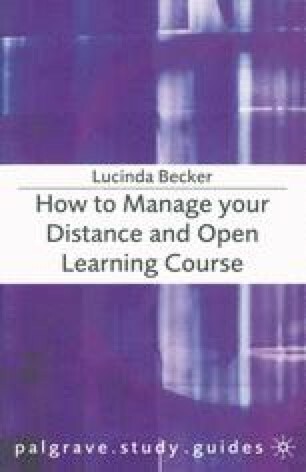 This book is designed to help you to identify your learning and management needs, and then to understand and develop them in the light of the demands of your course. It does not overlook the fact that you might need help with basic study techniques, such as tackling a reading list or producing an effective essay, but it will take you further than this, exploring each aspect of a distance and open learning course and guiding you through every learning situation as you progress.